GRAEME WELCH -- "everything that could have gone wrong did go wrong". Angry Derbyshire CCC boss Graeme Welch has urged his players to bounce back in the last match of the LV=County Championship match of the season after their crushing defeat against Essex. Derbyshire, reduced to nine men by injuries, sank to defeat by an innings and 188 runs against James Foster’s side at The 3aaa County Ground after being skittled for just 94 in the first innings, in response to the visitors’ mammoth total of 464-7 declared. With Shiv Thakor and Tony Palladino sidelined, Essex wrapped up victory on the third day with Ravi Bopara (4-29) and Ryan ten Doeschate (3-15) helping to bowl the home side out again, this time for 182. 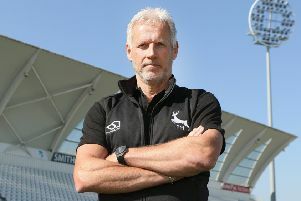 And Welch pulled no punches in his assessment of the drubbing, which left Derbyshire next to bottom in the Second Division table ahead of their final fixture at home to the only team below them in the table, Leicestershire. “We were very disappointed with many aspects of the Essex game,” said elite performance director Welch. “The best time to bat on the pitch was the second and third days, and yet we showed no fight. “Everything that could have gone wrong did go wrong. We lost two seamers in the first innings and then, as a result, lost them as batsmen. “But the rest of the team didn’t stand up. We were disappointed with how we bowled on the first day, and the bottom line is that we need to get better. “It’s the last-chance saloon against Leicestershire to get a home win. It is all about performance, professionalism, application and attitude. That’s what we are looking for from all of the players. Leicestershire, who trail Derbyshire by 36 points, arrive on Tuesday September 22. When the two teams met earlier in the season, Leicestershire pulled off one of their two wins this term -- by three wickets. Supporters are reminded that they can save £4 by buying tickets in advance.